This past weekend was our Friendsgiving and it was so lovely. There were over 20 of us and everyone brought something to the table, whether it was stuffing, mashed potatoes, brussel sprouts, cheese, rolls, gravy, or mini pumpkin cheesecakes (that one was me). We drank wine, ate delicious food, and just enjoyed everyone’s company. I didn’t know half of the people there but it was nice to meet new friends! I’ve talked about it before but Thanksgiving is my favorite holiday and I love anything pumpkin related. So clearly, match made in heaven. 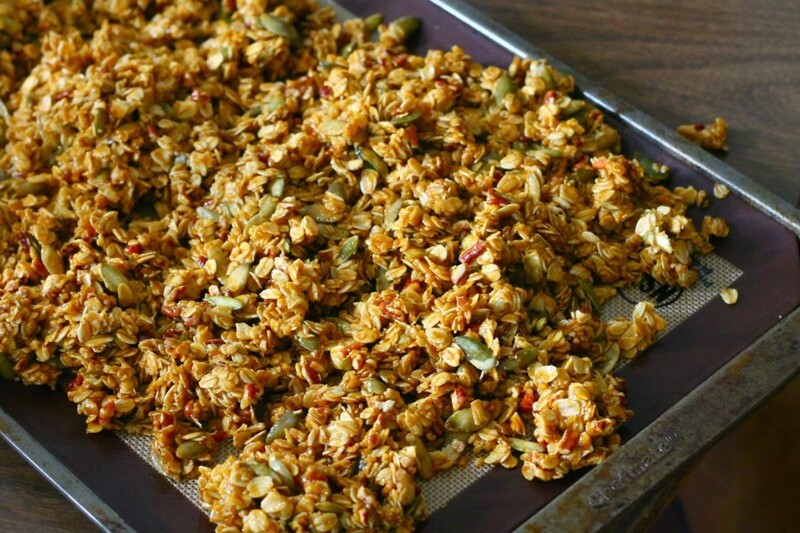 So, when thinking of what I want to eat for breakfast for the next week or two, the thought of pumpkin granola popped into my head. It’s seasonally appropriate (but something I could eat all year round too because, well, I can) and something delicious that has kickstarted my week and will make sure I’m not a hangry person by the time Thanksgiving dinner hits the table. Because I’m not the best hangry person. I either get really frustrated and snippy OR I start crying. And I never know which side is going to come out. Trust me and my friends. It’s both funny and sad. Preheat oven to 350 degrees. Line baking sheet with parchment paper or silicone baking mat. In a large mixing bowl, stir together oats, pumpkin seeds, pecans, salt, pumpkin pie spice, cinnamon, and nutmeg. Set aside. In a sauce pan over medium-low heat, add pumpkin puree, maple syrup, coconut oil, brown sugar, and vanilla extract. Stir together until coconut oil and sugar have dissolved and the mixture is smooth. Pour over dry ingredients and stir together until well mixed. 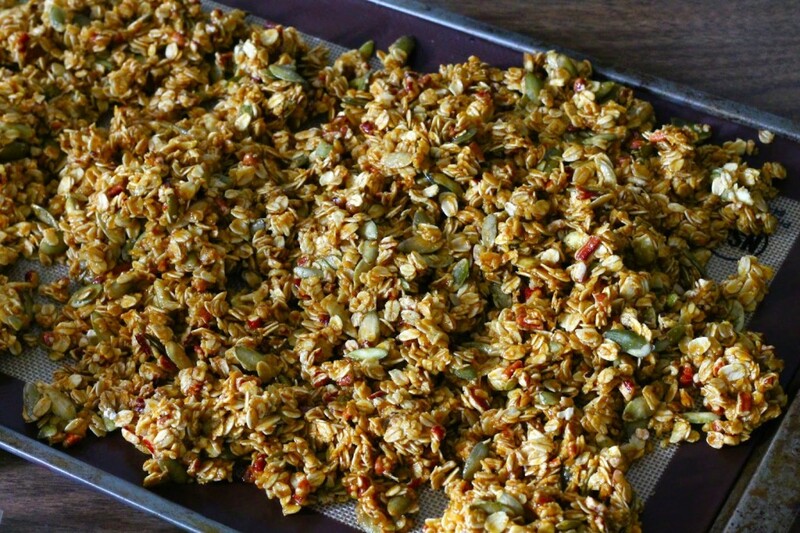 Spread out over baking sheet, pressing down with your hands.Bake for 20 minutes, lightly stir granola, and bake 5-10 minutes more or until golden brown. 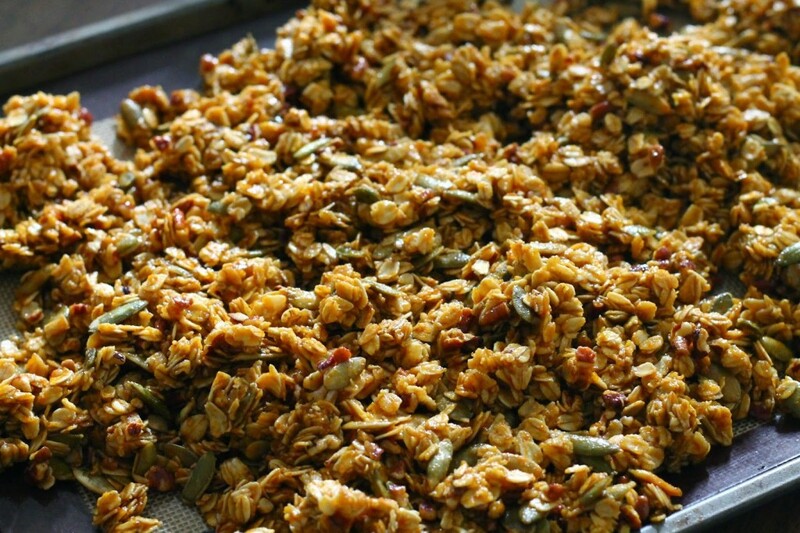 Let cool on baking sheet for 10 minutes, clump granola with hands, and let cool completely. Store in airtight container.